In May, the Martial Arts School I attend (Tampa Quest Martial Arts) hosted the first ever Regional Ninja Festival. 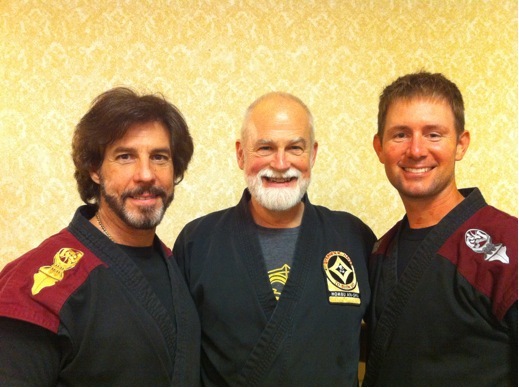 With an attendance of over 100, participants from California, Colorado, North Carolina and Nebraska, Mark Sentoshi Russo and An-Shu Stephen K. Hayes celebrated their 30 years of training together and Sentoshi Russo’s 45 yrs. of Martial Study. The focus of training revolved around the theme for An-Shu’s teachings this year: Nine Cuts-Nine Powers a reference to the ninja’s legendary kuji-kiri “nine-letter cut” – a grid of horizontal and vertical slashes that project our power out into the world to give a boost to our intentions, to create good and diminish negative. At this particular seminar, we explored the 8th aspect of these human potentials, “manifesting what you need in the world”. This special weekend was highlighted with Sentoshi Russo earning his 8th degree Black Belt, making him the highest ranked student of To-Shin-Do founder, An-Shu Stephen K. Hayes. Congratulations to Sentoshi and this incredible achievement! Contact me today for your future event. Design by: MJRaptis ©2019 FiredUp! Entertainment Inc.